When you come home to find your houseplants chewed up and the only possible culprit is your cat, your first impulse may be to punish it. Don't. 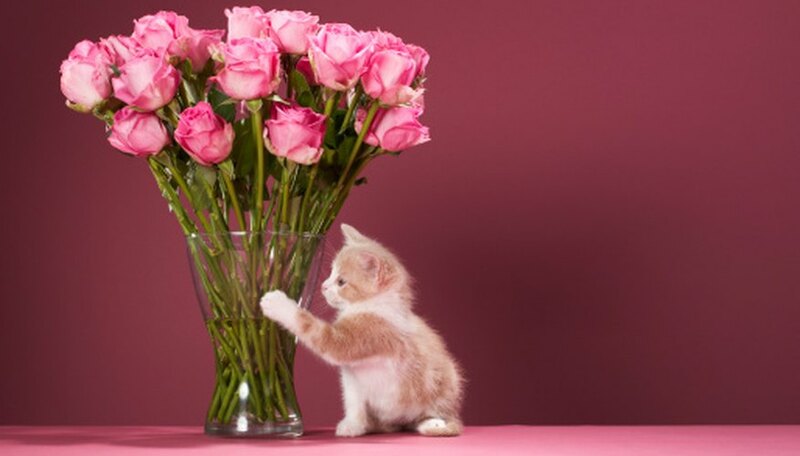 Cats do not see the relationship between eating your houseplants and punishment. Constant punishment leads to an aggressive cat who fears you. In the meantime, the cat will continue to eat your houseplants. Knowing how to cat-proof your houseplants allows you to have decorative houseplants in your home, maintain a healthy relationship with your cat and keep yourself stress-free. Give your cat other types of plants to chew on to keep it away from your houseplants. Cats enjoy catnip and oat grass. Usually indoor cats enjoy eating houseplants because they do not have access to grass and plants outdoors. Your cat may not be getting enough vegetation in its diet and has a craving. House plants provide the fiber your cat needs to help relieve hairballs, for instance. Spray the leaves of your houseplants with water. Shake a little cayenne pepper on the leaves and on the soil around the plant. Cats find cayenne pepper unpleasant to deal with and will stay away. The spice is harmless to your cat and houseplant. Cut up citrus peels from lemons and limes and sprinkle them around your houseplants. Cats cannot stand the smell of citrus. Spray houseplants using a commercial pet repellent. These repellents make the plant taste bad to your cat. Place your houseplants out of your cat's reach. This may mean having hanging plants away from furniture or anything your cat can climb on. Purchase commercial cat repellents from pet stores, garden supply centers and online. Some houseplants are poisonous and deadly to your cat, including philodendron, English ivy, daffodils, wisteria, oleander and mistletoe. Contact your veterinarian if you see your cat having difficulty breathing, or vomiting, convulsing or breaking out in skin rashes.